Instead of imprisoning animals for profit, why not support shared efforts in coexistence? Brookfield Zoo in Illinois. Credit: Flickr/Lyle. Some rights reserved. In the past month the deaths of animals in captivity have highlighted continuing concerns around conservation. Zoos are entertainment, and while they contribute to conservation they don’t provide any real solution. Wildlife can only be saved by empowering their protection in their own natural habitats—and that means we have to work with local communities and not against them. On 28th May 2016, for example, Harambe, a captive born gorilla, was shot dead after a young boy fell into his enclosure at the Cincinnati Zoo in the United States. One week earlier, two lions were destroyed at Santiago’s Metropolitan Zoo in Chile, and a week before that a Sumatran elephant called Yani died in the notorious Surabaya Zoo in Indonesia. An online discussion has exploded about each of these sad cases, but by and large it’s a debate that excludes the views of those most important for success. Opponents of zoos such as Marc Bekoff, a behavioural ecologist and professor emeritus at the University of Colorado, argue that an animal’s life in captivity is a shadow of their experience in the wild. Proponents of zoos such as the World Association of Zoos and Aquariums counter that the conservation benefits zoos provide outweigh the isolated (albeit tragic) costs paid by the animals involved. On social media zoo supporters say that captive animals serve as conservation ‘ambassadors’ for their wild counterparts, and that zoos are a ‘Noah’s Ark’ that provides a buffer against the decline of endangered species. In truth, this is a script that even the zoo industry has quietly abandoned. While some species such as oryx, wolves and condors have benefited from captive breeding programmes, there is precious little evidence that zoo bred genetics are being used to strengthen wild populations of gorillas, elephants and dolphins. Zoos recognise that they have insufficient space to engage in successful breeding programmes for large mammals, and are unable to accommodate more than the smallest fraction of the world’s 22,784 species that are threatened with extinction. So why do zoos persist? Zoos began life as amusements, and while they have evolved they still exist to make money and tap into a wealthy societal appetite for entertainment. But at a deeper level they are key components of an international conservation system that resembles the West’s colonial and racial past. This system believes that communities in parts of the world where most endangered species live are a problem that must be fixed—most often by acquiring traditional lands, establishing camps and other experiences for wealthy tourists, and employing gun-carrying guards to patrol the boundaries of parks and reserves. Both zoo proponents and their opponents rarely recognise that discussions about conservation radiate almost exclusively from Europe, North America and Australia. Meanwhile, the voices of those who actually live alongside the animals in question are ignored. 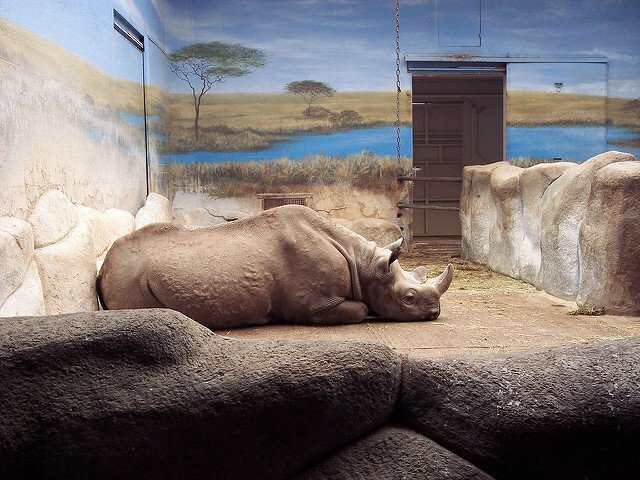 To fill their exhibits, zoos either breed animals or remove them from the wild. And that leaves a trail of money behind each individual animal as it moves from one enclosure to another along the long chain of captivity, bearing an uncomfortable resemblance to other commodities that are traded under global capitalism including slaves and human trafficking. However, most of this money doesn’t flow to the communities where these species naturally live. It flows between professional (and sometimes illegal) wildlife traders and the coffers of governments along the way. Sometimes animals move through intermediaries, perhaps to remove any traces of their origins. Zoos do invest in conservation programmes, but the generosity of these exchanges is small compared to the profits that are derived from the animals in their exhibits, or the large sums that are spent on acquiring animals and creating zoo displays: in 2011 John Fa and his colleagues calculated that investments in situ or in local conservation efforts represented less than five percent of the total income of zoos in the USA. The people of the forests and lowland swamps of Central Africa—the home of Harambe’s kin—don’t sit on the Board of the Cincinnati Zoo. Communities in the arctic north are not part of the management decisions for Walker, Victoria and Arktos, three polar bears at the UK’s Highland Wildlife Park. In 2015 Big Game Parks, the trust that manages three game reserves in Swaziland, sold 15 infant and three pregnant female wild elephants to US zoos. The move was roundly condemned by more than 80 experts as having “no single redeeming virtue.” Were local people’s views sought or listened to in this transaction? My sources say no, yet many zoos continue to imply that their exhibits exist to contribute to conservation in these regions. What would happen if these communities were asked for their opinions on how best to conserve animals with which they’ve lived for generations? Instead of transporting elephants halfway around the world, they might ask for support to move their village outside of a wild elephant migration path. They might prefer that efforts were focused on reducing carbon emissions so that polar bears and their human neighbours could continue to live their lives successfully on the ice. They might also ask for assistance to help buffer the impact of globalisation on their livelihoods so that trading, hunting and poaching could be reduced. My bookshelves are buckling under the weight of science and discovery about animal cognition and culture that has exploded in the last ten years. But my most treasured possession is a copy of a book called A Communion of Subjects, edited by Paul Waldau and Kimberly Patton, whose pages echo with the stories of the many ways in which people across the world relate to animals. Many human cultures understand that people and wildlife share the same spaces, and therefore need to cohabit in order to survive. Human and non-human cultures alike are threatened by pollution, deforestation and climate change. The destruction of the natural world impoverishes everybody. So if we did ask local communities for their opinions on what to do about these issues, we might be surprised by their suggestions. But for these voices to be heard, zoos have to abandon their dominant position in debates over conservation, a position which overshadows the multitude of smaller views and the wisdom they often represent. Zoos should speak with honesty about the work they do and don’t do, and admit that many of their living exhibits are designed for profit. This honesty would allow their visitors to have a much franker engagement with the issues surrounding endangered species, one made more powerful by direct witness of the animals they are discussing—like a silverback gorilla that has been robbed of his heritage because he earns money for the zoo. It would also give zoos more leverage to promote other attractions that are not mired in the same ethical debates, such as species that are local to the region of the zoo, or computer simulations and robotics. When zoos cease to dominate the conversation, the public will be able to hear how they can empower local conservation efforts wherever apes, elephants, dolphins and big cats are threatened—and what the stewards of their natural habitats can do the stem these risks. By reversing the neo-colonial structure of international conservation, this will put animals and people at the centre of the debate.